I’ve been trying to figure it out for some time now. What is it about early ’90s sportbikes that gives my stomach butterflies? Is it the round headlights, the voluptuous fairings, or the lack of electronics? Whatever the reason, there is one bike in particular that has been on my realistic must-have list for a long time: the Honda CBR900RR. Back in 1992, Honda released a machine that had no equal. Sure, there were larger bikes, lighter bikes, more powerful bikes, and of course, more prestigious bikes. But the Honda CBR900RR was a bike that rewrote the sportbike rule book. It was light, it was powerful, and by God, it looked awesome. It featured an engine displacement of 893cc which did not fit into any of the existing top-tier racing series. The FIM World Superbike class of the time restricted four-cylinder engines to 750cc. Honda didn’t set out to fit the current mold of racing bikes, it set out to make the best road-going sportbike you could ask for. With a wet weight of only 453 pounds, the scales nearly balanced with Honda’s own 600cc sporting machine of the time. Having 124 horsepower and 65 lb-ft of torque on tap from its inline-four engine, this bike shattered everyone’s perceptions of two-wheeled performance. The bike initiated the storied Fireblade nameplate which still lives on to this day. Twenty-five years since the introduction of the 900RR, the Fireblade series has seen an evolution of Honda’s original plan: Lightweight, powerful, and refined superbikes. I wanted the bike that started it all. I had to get my hands on one of Honda’s original CBR900RR Fireblades. 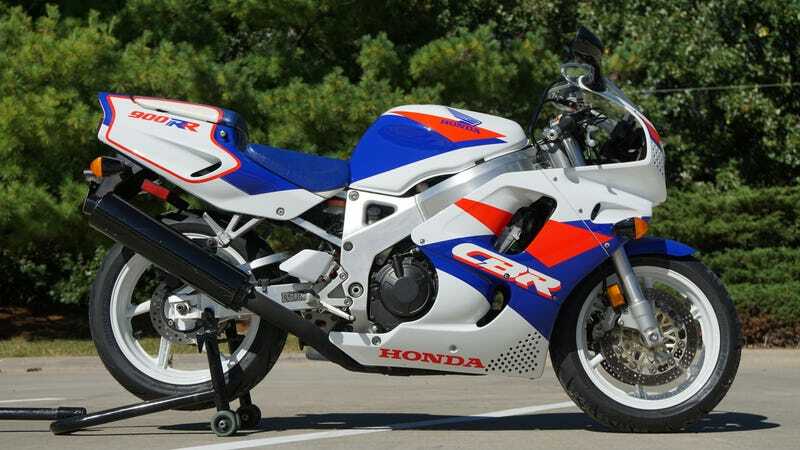 The CBR900RR was first released to the public back in 1992. However, here in the USA, we didn’t get it until 1993. I wanted to find a bike from the first two years that were available in the USA, 1993 and 1994. These model years were equipped with the iconic round headlights up front. They look like something straight out of the Road Rash video game. And, in case you are wondering, that means these are the most awesome versions. These CBRs were mass-produced Japanese motorcycles. They were available back in ’93 in the same way that the 2017 CBR1000RR is available in showrooms today. They weren’t exactly rare bikes. But that was 25 years ago. Just try finding one now. It doesn’t matter how deep your pockets are, there simply aren’t that many out there. Go ahead and look. I’ll wait. You back? Okay, here’s the deal on these (which is true for pretty much any sportbike): they lived hard lives. Rear fenders got cut up, turn signals were removed, exhausts were swapped, bodywork was repainted, and the list went on. These sportbikes got thrashed, crashed, raced, and stolen. Most have quite simply vanished. Ten years ago, when they may have still be somewhat plentiful, no one really wanted an old Honda sportbike. New bikes were so much “better,” so why would anyone want an ancient, thick-bodied, carburetor-fed, sports machine? Well, people want them now, and they want them bad. I had been searching for one of these bikes for a few years. They’re thin on the ground, especially out here in Kansas where I live. Every once in a while, one would come up for sale that looked original-ish. I would go check it out, but would always end up leaving disappointed. Craigslist pictures make rough examples look showroom-fresh. I stopped looking intently because I figured it just wasn’t going to happen; nice ones just didn’t exist anymore. It couldn’t be! Not only was this the exact kind of bike I had been in search of for years, it was less than five miles away. It was the right year, the right color, and the price was reasonable. The mileage had to have been a typo—the ad said 998 miles. Surely the seller meant 9,980 miles or something along those lines, I figured. There was only an email address on the ad, so I sent the seller a message, nervous that I had already missed out on this once-in-a-lifetime opportunity. I received a call later in the day from the seller. He said he still had the bike and that I could come see it that evening. What a stroke of luck! When I arrived to see the bike, it was apparent that the motorcycle hadn’t been ridden in many years. The seller was the original owner, and sure enough, the mileage in the ad was a typo. It only had 988 miles on the clock, not the 998 that was stated in the ad. Simply unreal. That used to be brake fluid in there. It was all original aside from period-correct modifications like color matched seat and tank covers. The rear fender was uncut and the original exhaust was intact. These are some of the parts that you simply cannot get anymore. Phew! Bullet dodged. The bodywork, however, had a couple of scratches from a side-stand tip-over. Apparently the bike was parked on asphalt on a hot day and the side stand sunk into the pavement, laying the bike down on the left side. The seller had told me about this over the phone, which sent me on a crazed journey of searching for new-old-stock parts to put the bodywork back to mint condition. Sure enough, the needed parts were still available new. I couldn’t hear the bike run as the battery was flat and the carburetors were completely gummed up from old gasoline. I had to make a buying decision based on my gut feeling alone. What I didn’t know was that in the period of time between first talking with the seller on the phone and the time that I showed up to look at the bike, the price firmed up. The “Or Best Offer” was completely off the table. The seller had been inundated with emails from all over the country offering well above his asking price - he wasn’t aware of how desirable his old Honda actually was. There was no more negotiating left in the cards, I had to cough up the whole $4,000. Finally putting that Tacoma to use. With the money handed over and the title signed, I was now the owner of a sub-1000 mile 1993 Honda CBR900RR. The realistic dream bike was mine, as was the mountain of mechanical work ahead of me. Stay tuned for a classic Honda CBR900RR overhaul. First day home, let the work begin!